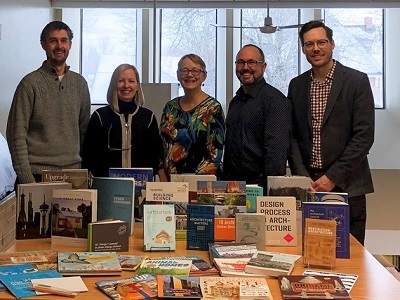 As reported on BayToday.ca, the North Bay Society of Architects (NBSA), a non-profit organization comprised of local architects and architectural professionals, visited the North Bay Public Library this week to present a donation of over 90 architecture-related books. They ranged from easy-reading children’s stories to manuals on building construction, and everything in between. The value of the books totaled $1,500. The book donation was spearheaded by a member of the NBSA’s Executive, Jeff DeDecker, as a way for the group to support the local community says a news release. The selection of donated books was developed together with the staff of the North Bay Public Library, to ensure the donation would appeal to a broad range of library visitors. In particular, the NBSA focused on selecting books written for children and teens. “Children and students are naturally creative and curious. The collection of books we were able to provide for the library will certainly serve as a valuable community resource for nurturing young minds and encouraging and promoting architecture and the architectural profession” De Decker noted. The collection is expected to be in circulation by the end of the month. Interested library patrons are encouraged to visit the library and inquire about their availability.